Add to cart and checkout! Made from real whiskey barrels – We have a contract with a major cooperage that supplies new white oak barrels to distilleries all over Kentucky. Once they’ve aged bourbon in the rickhouse, they are sent back to the cooperage, who then makes sure the barrels are once again put to good use as re-purposed bourbon wood. Carefully processed and assembled by hand – The bourbon barrel heads (lids) come to us as loosely assembled slats, since pressure and good craftsmanship hold the barrels together (and never glue). In order to make sure they stay together, we’ve created our own process of fitting a piece to the back to hold the slats together, and adding hardware to make sure it hangs safely on the wall. Authentic and unique – Each barrel head shows distinct signs of its history in the famous rickhouses of Kentucky. 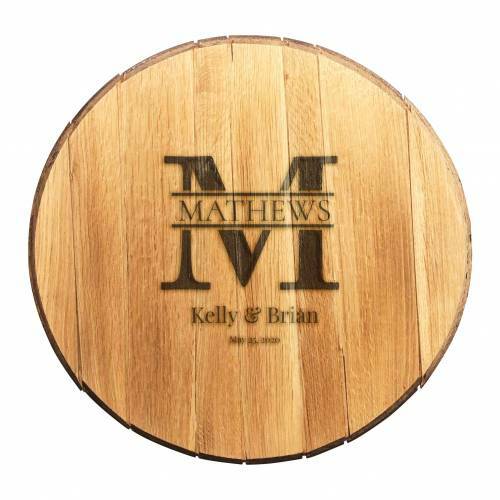 Depending on which product you order, you may see the whiskey mark (stamp) or the charred wood through a viewing hole we add to our backing boards. Like every batch of whiskey, every barrel head tells its own story. We don’t manufacture these – the cooperage does with a little help from some of America’s best bourbons and whiskeys, so no barrel head we send out is ever perfect. You may see slats that don’t line up perfectly, or there may be gaps where the wood has swollen and contracted over the years, but to us, that imperfection is beautiful. 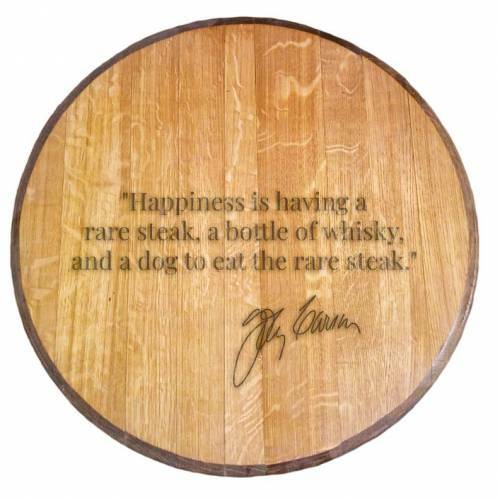 Laser Engraved, not Printed – You can see and feel the difference. Designs are laser burned in, giving depth and a contrast to the wood while also maintaining a rustic and natural look. 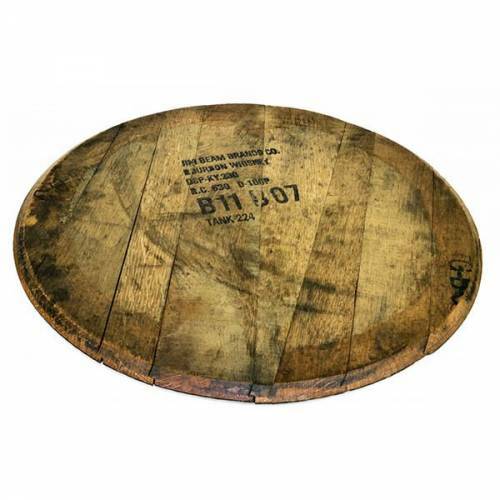 A solid piece of American craftsmanship – Weighs 12lbs and measures 21-22″ in diameter and around 1.5″ thick. This baby was rolled around in rackhouses and used to store 50+ gallons of bourbon at a time. It is solid as a rock and will stand the test of time. When the barrel heads arrive in our studio they are charred and bourbon soaked – which means you can still smell smokey whiskey notes when you open your package. We prepare them for their journey by tightening the loose slats, adding a solid wood backing board to hold them firmly in place, then sanding and refinishing the top down so that it is clean and flat. 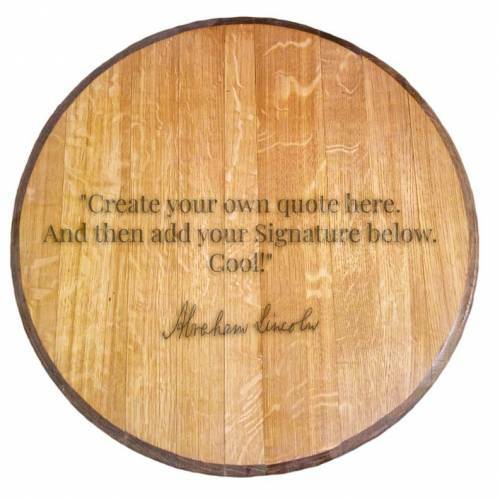 Once you give us the go-ahead, we engrave your design into the wood with our 150w laser and finish it off with a clear fixative to seal it all up. The laser will give your design varying depth and the contrast of the burned/sanded wood will give it a dynamic look perfect for your wall or home. We reclaim a prime barrel head from a genuine, distillery used bourbon barrel. We clean, dry, and sand it down until it’s bright and smooth. We laser engrave your custom design – permanently burning in all the details. A clear fixative is added that seals the wood. We pack it up and ship it to you via your preferred shipping method. 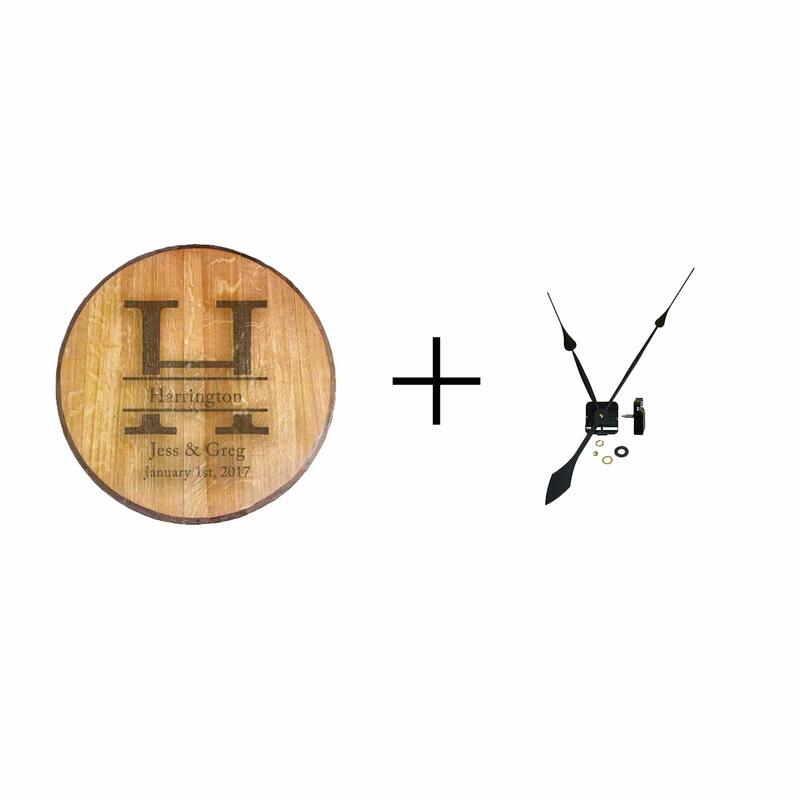 Turn your barrel head into a clock! Includes machining to the barrel to accept clock components, hands, movement, and all hardware. Make your Barrelhead a centerpiece! 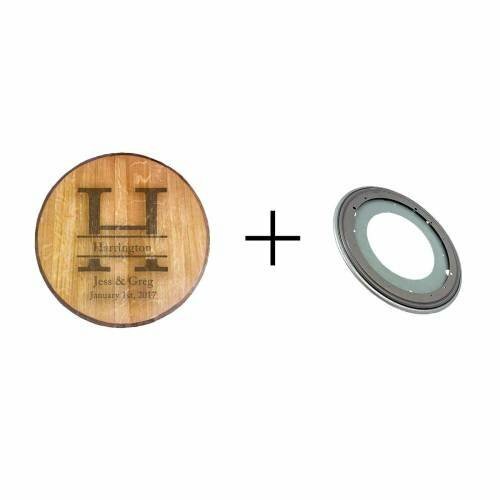 Display it on a countertop or table with this lazy susan turntable. We add a 1000lb turntable and mount it to the underside. 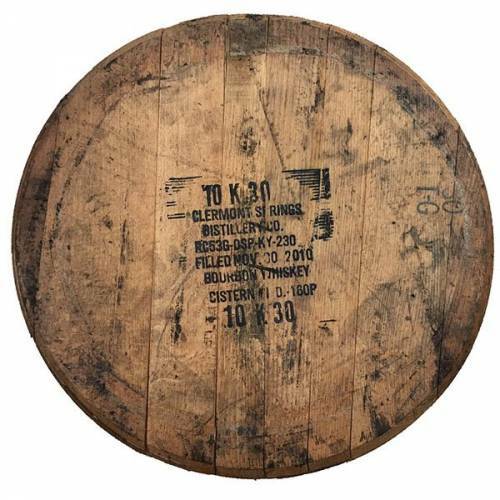 We select a prime barrel head, which has been reclaimed from a genuine, distillery used bourbon barrel. It is dried and planed so it is bright and smooth. We remove the charred side of the barrel so there is no soot. We laser engrave your custom design and burn in all the details. A clear coat is added to seal the barrel head. We pack it up and ship it to you. Includes hanging hardware for you to display. We source the best bourbon barrels from the local distilleries in the Bourbon Belt. We clean them up and re-purpose or customize them for avid Bourbon fans like you.